RVC Outdoor Destinations, the leading provider of high-quality outdoor vacation properties in the United States, today announced the launch of its Wounded Warrior Fishing sponsorship, an initiative underscoring the company’s commitment to active and retired military personnel. RVC Outdoor Destinations has partnered with retired U.S. Air Force Staff Sgt. and current U.S. Coast Guard Capt. Mark McDuffie, to offer the program, which is designed to help soldiers injured physically or mentally in Iraq or Afghanistan relax and enjoy the outdoors with their families. The Wounded Warrior Fishing program, headquartered at the company’s Live Oak Landing property in Freeport, Fla., will host an injured soldier and his or her family one night each week to enjoy the outdoors through activities such as fishing trips, river tours, onsite recreation activities and a cookout – all free of charge. 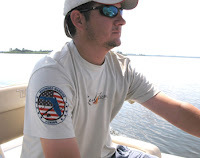 McDuffie first started the program a year ago, as a nonprofit called Wounded Warrior Fishing. Injured while fighting in Iraq and now fully recovered, McDuffie operates at the Live Oak Landing property and will head up the new partnership sponsored by RVC. Wounded Warrior Fishing and RVC will officially kick-off the program on Memorial Day weekend to coincide with the unofficial start of the summer travel season. In addition to the weekly sponsored accommodations, Live Oak Landing will host 10 injured soldiers and their families during an end-of-summer celebration the last weekend of September. The group will be able to fish with local professionals, take boat rides on the Choctawhatchee Bay, eat BBQ from local restaurants, enjoy massages and relax. Besides the new Wounded Warrior Fishing sponsorship, RVC also offers active and retired military members discounts on lodging, and several of its properties offer a free RV site rental for active service men and women through the Tents for Troops program. RVC locations individually raise money for regionally based military charities through their own events and fundraisers throughout the year. “RVC believes in taking care of the military men and women who have made a tremendous sacrifice for our country,” said Andy Cates, president of RVC Outdoor Destinations. “We wanted to find a meaningful way to say ‘thank you,’ and for us that means giving them a chance to have some fun in the great outdoors with their families. To nominate someone for the Wounded Warrior Fishing program, please contact McDuffie at mark_mcduffie@hotmail.com or call RVC’s Live Oak Landing at 877-436-5063.